This liqueur is packaged in a 70cL clear glass bottle. The labeling exhibits a graphic of a Belle Epoque cafe scene, and has an antique motif. The top label exhibits the familiar "spiritueux aux plantes d'absinthe". 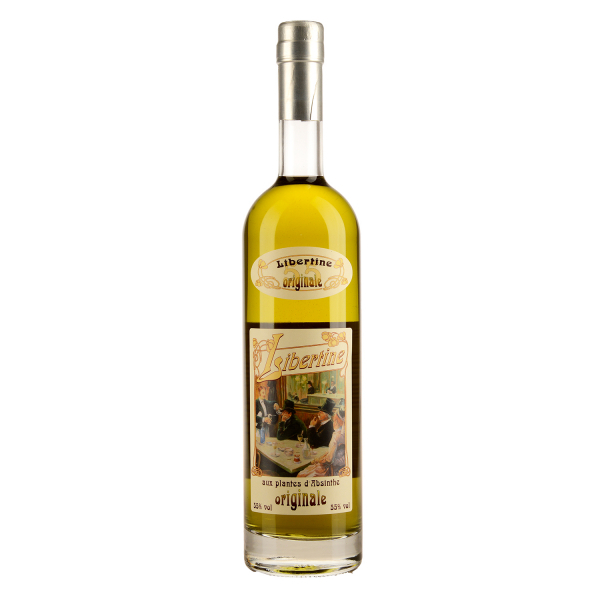 The main label lists the ingredients as a maceration and distillation of plants, alcohol, and sugar. I've visited the distillery where this product is made, and can confirm that it is made via an assemblage of macerates and distillates. Due to its particular method of manufacture, the assembler cannot really use A. absinthium without the end product being horribly bitter, and therefore A. pontica is substituted. As a result, the end product contains no A. absinthium, and is therefore not a true absinthe. Libertine would be more appropriately described as perhaps a 'liqueur d'armoise'. Upon removing the cap, once senses a mild flavor of anise followed by a subtle sweetness and not much heat. The liquor itself is naturally colored and the initial green hue quickly fades to an amber tint because of its clear glass bottle. Tasting it neat reveals only subtle heat along with a distinct flavor of anise up front, followed by a mildly sugary texture. When diluted with water, the liquid louches moderately with fairly heavy gradient lines. The taste of the drink is rather light, sweet, and aromatic, with anise being the predominant flavor followed by mild brandy notes, and no bitterness. In conclusion, the appearance, texture and flavor of this liqueur is a bit reminiscent of Versinthe, but is lighter in texture, more refined in flavor, and not nearly as sweet. It makes for a pleasant drink. Related links to "Absinthe Libertine Original"
Customer evaluation for "Absinthe Libertine Original"